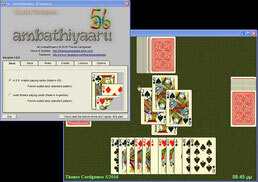 56 (Ambathiyaaru) - thanoscardgamess jimdo page! This is an expanded form of 28, played in Kerala, India. It is a trick taking game where the Jacks and the Nines get promoted. There is an elaborate bidding phase to determine the trump suit and the anticipated tricks.